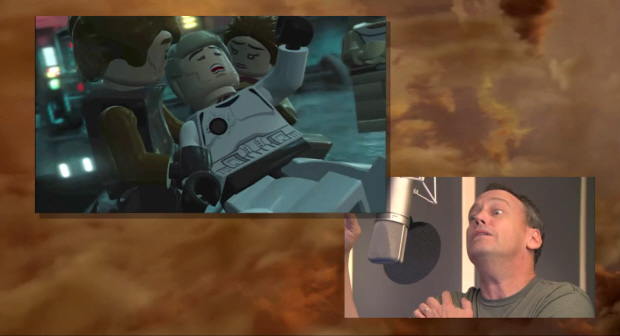 What goes on behind-the-scenes in Lego Star Wars 3: The Clone Wars as voice actors put their vocal sound-effects to work in the videogame version of the hit animated series? Lots of hilarious, goofy fun, that’s what! This absolutely awesome video gives you a very interesting look at an aspect of Traveler’s Tales’ Lego games that you don’t even generally think about while playing. That is, all the grunts, groans, yawns, yelps, shivers and other vocal sound effects that make up the funny cutscenes spread throughout the game. What’s amazing is how much animation is given off by the actors themselves, which translates into pitch-perfect CG cutscenes, as well as laugh-out-loud documentary footage! See what I’m talking about in this video.